Last week, I bought some really nice strawberries and made a fruit cake. It's a simple and classic fruit cake you can find in almost all bakeries here. Layers of light sponge cake, sandwiched with layers of strawberry cream and there you go. For the strawberry cream, I mixed whipped cream with pureed strawberries, with a little icing sugar for taste. It was a small cake, just 6". I cut it into quarters and had them for breakfast for 2 days with my husband. 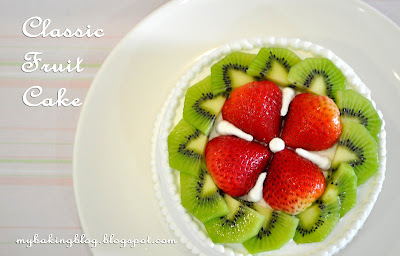 I see so many of novelty and fanciful fondant cakes these days, it's almost nostalgia to see eat the fruit cake. While I was eating it, I thought of the buttercream cakes that were so prevalent when I was young. Those were in every neighbourhood bakery and I particularly remember sinking my teeth into those from Sweet Ring and Mayflower cake shops. I don't think they still exist today, but someday, I'm gonna make myself some of those buttercream and pipe them in the way that those shops did. To me, it was not about the taste alone. It was about the look of the cake slices. The buttercream stripes, the colourful dots piped with piping gel. They look so classic and now, retro. Someday, when I make those, I'm gonna enjoy them while putting on my bell bottoms, platform shoes and having my favourite 80s retro music. And, it's not retro without Strange Love by Depeche Mode. I've digressed. I get so excited at the thought of retro music, of Depeche Mode, that I wish I am in a pub with my friends in Boat Quay right now, blasting Strange Love. During happy hours on a Friday night. Ten years ago. Damn. I think I am hanging on too much to the past. Back to now. The recipe and instructions for the cake is here. It is a very light and fluffy cake, but you could basically use any Victoria sponge cake and do the same if you want to. Now, kindly leave me alone for now. I'm blasting Strange Love on my laptop speakers *shakes head uncontrollably with eyes closed*. Hmm.. I love fruit tarts! Especially in the summer when it highlights all of the summer berries :) Thanks for stopping by my blog! !